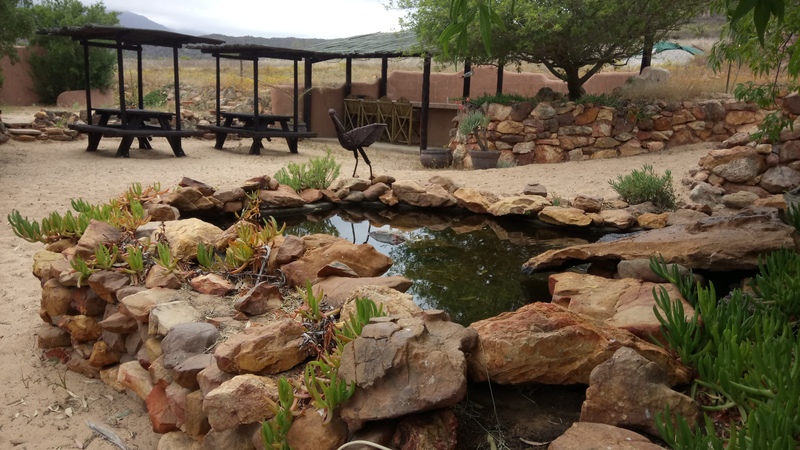 Our stay at Gecko Creek Wilderness Lodge – and overall first-time experience of the Cederberg – was something I had planned two months in advance. This was made effortlessly simple thanks to owner Linton and then-overseers and managers, Monica and Glenn. We arranged dates and in reply, they sent me a detailed email highlighting all the dos and don’ts of Gecko Creek. I appreciated this because it made my planning job that much easier. Small touches like this ensure that the traveller is well-prepared for their visit, whether they do further research or not. 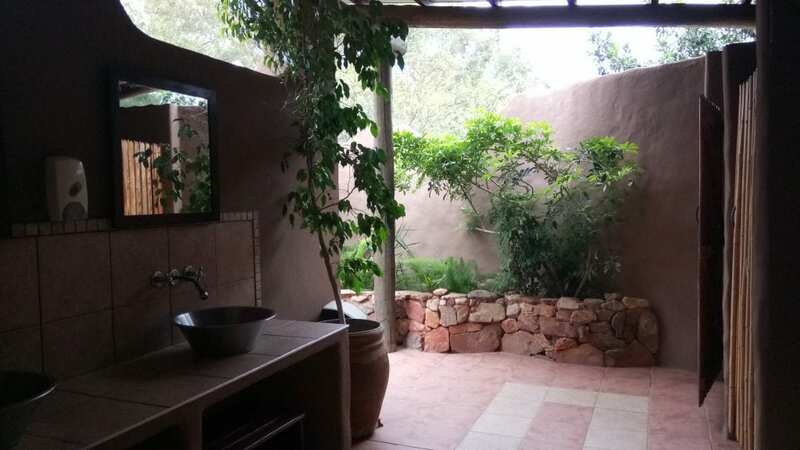 For instance, we knew that we needed to pack in our own towels and food and drinks (although the on-site shop offers wine, beer and snacks etc.) and a torch. We left work at 16:00 pm and arrived at our destination just after sunset. 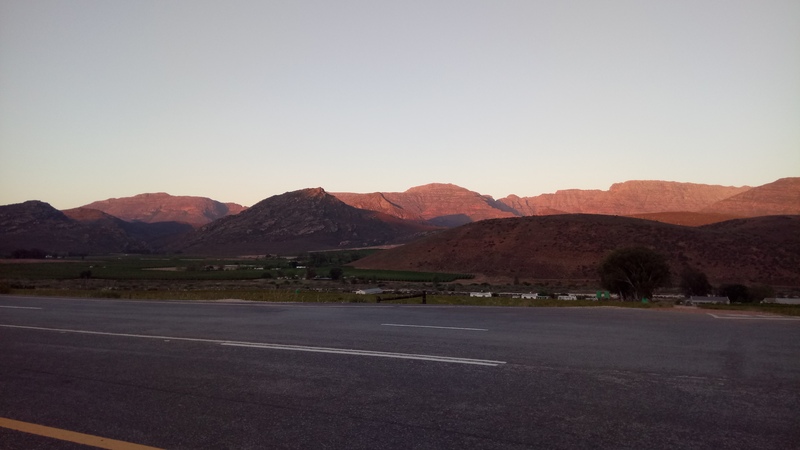 This came after a calm drive, curling our way up the breathtaking Piekenierskloof Pass before easing into the quiet farmlands of Citrusdal. As our eyes registered sleepy farmlands, we rolled down our windows to let in more of the sweet scent. It took me back to my childhood, especially as that smell had often flavoured it. From there, we turned down a rugged dirt road (drive slowly and carefully on it, especially at night). 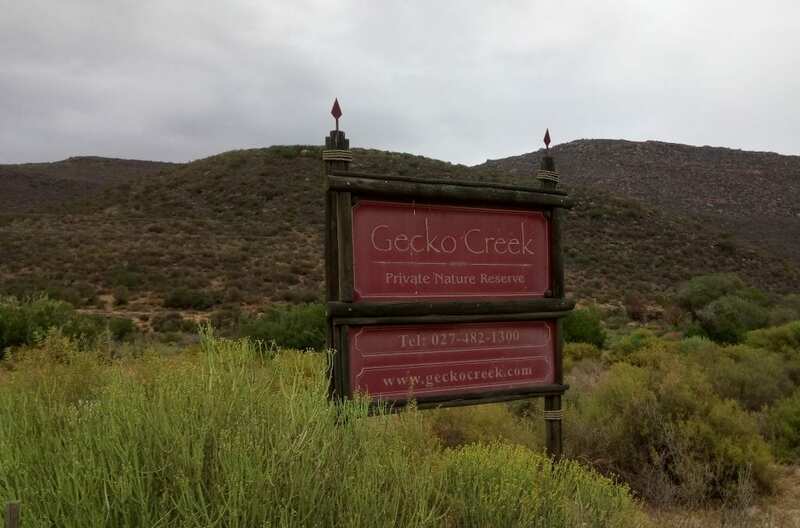 After a short-ish drive, we found the rather impressive maroon sign, proclaiming our arrival to Gecko Creek. Another group of travellers arrived at the same time of us; fortunately, Gecko Creek has several parking spaces up front. As we waded out onto sandy ground, encircled by vast gums, I realised that Gecko Creek is even prettier and more secluded than its website showed. With twinkling lights, emerging from the trees (where the lapa rests), a feeling of contentment washed over me, making me think of the last stop-over point one reads about in Tolkien’s The Hobbit… But, instead of Rivendell and its elves, we found safari rusticness and Cape charm. 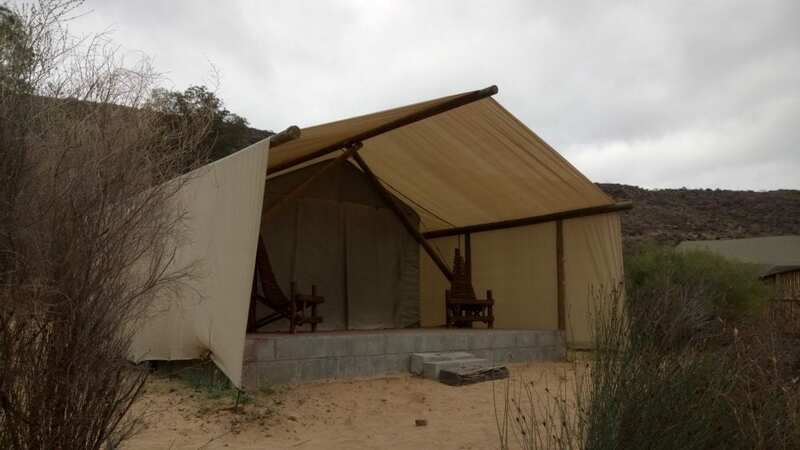 Owner Linton and his caretakers have ensured a peaceful, well-equipped and rustic wilderness escape… They have also successfully taken the rough-and-ready elements out of camping. 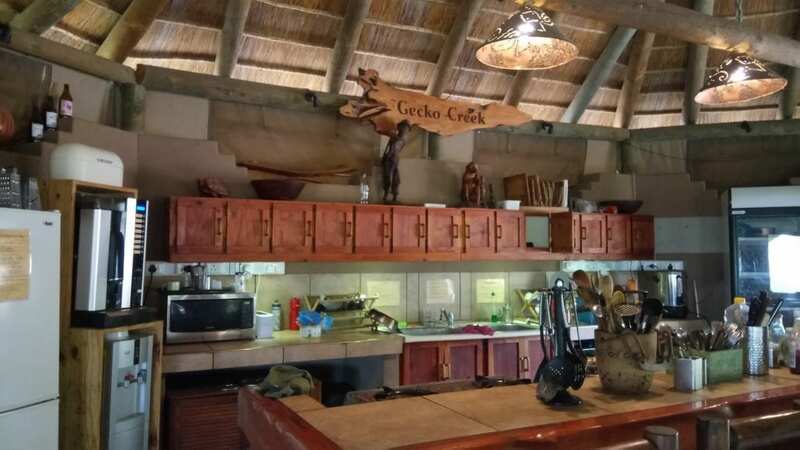 At Gecko Creek, whether you stay in a cabin or safari-style tent, you’re assured a degree of basic camping luxury. We made our way into the reception (found next door to the lapa and across from the boma/braai area), where both Monica and Glenn gave us a good welcome. They filled us in on where everything was and told us all we needed to know. As a start, Glenn gave us a guided tour of Gecko Creek, taking us through the communal kitchen and main indoor eating area. Inside the weatherproof lapa – surrounded by plants and bird life – you will find several tables and chairs for dining or relaxing. 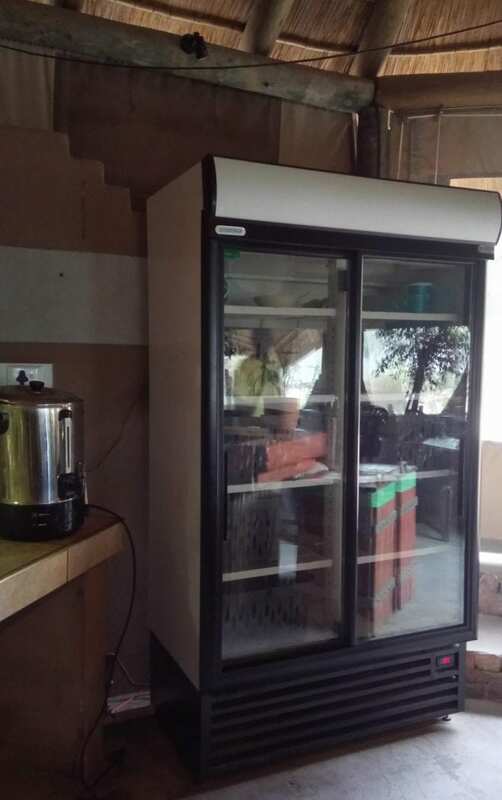 There are also neat cooking facilities, supplied cutlery and crockery and fridges. The basic run-down of the communal kitchen – a new concept for us – is simple. Whatever you cook with/use to eat for yourself, you must wash up afterwards. And try not to leave things in the sinks too long after you’ve eaten, so you don’t inconvenience fellow guests. The fridges have a grocery basket for storing each individual’s goodies in. This ensures nothing gets mixed or used by someone else. I thought this was a great idea, especially for shared living! If you order meals from Gecko Creek (because they do have quite a decent breakfast, lunch and dinner menu), then you are not required to wash up afterwards. Try order before 17:00 pm daily and ensure that you specify a rough time for when you would like your meals by. Meals get served in the lapa; they’re brought to your table and kindly cleared away afterwards. Also, if you do order meals, you can pay upon ordering or well after you’ve eaten. To make it easier for us, we paid for our meals when we checked out. If you are in need of a coffee fix (I raise my hand in guilty admission), Gecko Creek has you sorted with a cool Swiss coffee machine. All you need to do is insert R1, R2 or R5 coins into the slots and choose your desired coffee! There is also wonderful mountain spring water at Gecko Creek so be sure to fill up your bottles. 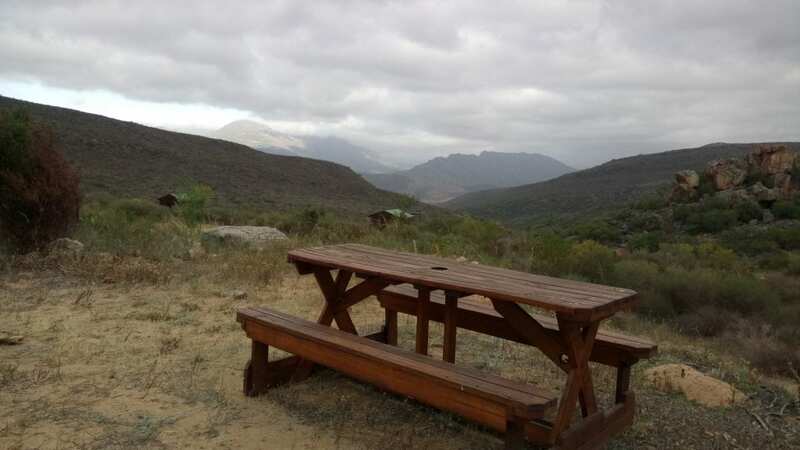 Especially if you’re planning to hike in the Cederberg region during your stay. There is also free, strong Wi-Fi in the lapa but I didn’t miss not using my phone much for a change. Also, please be advised that Gecko Creek is a cash-only facility, because they don’t have a card machine on the premises. 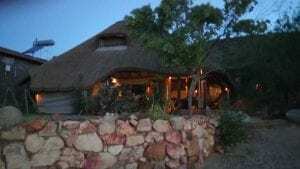 From the kitchen, Glenn took us to the boma. 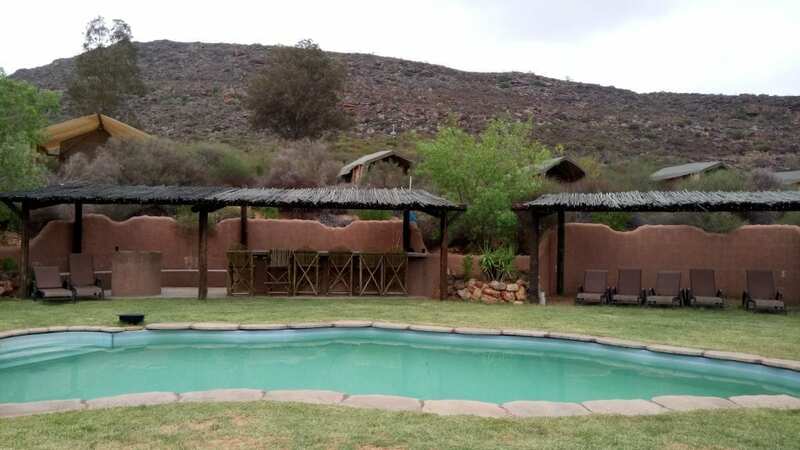 This large, walled area offers a cool braai area, with bean bags, an outdoor pizza oven and braai equipment found within. You might even see one of the geckos too… albeit a non-living wall piece! Gecko Creek sells charcoal bags for braaiing. 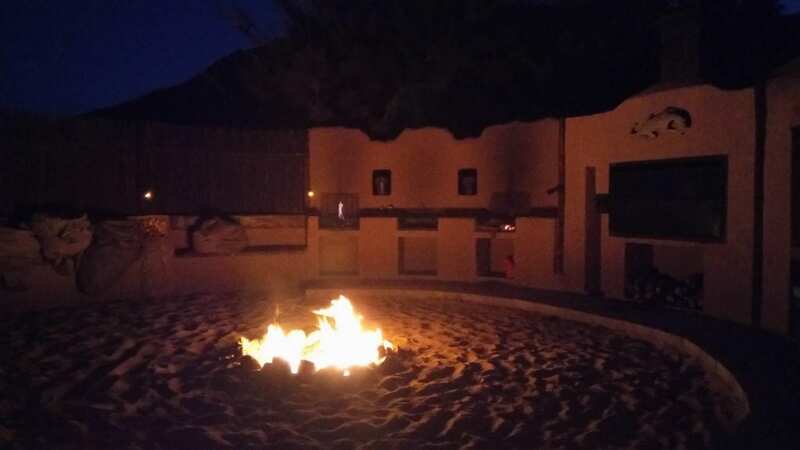 No wood-fired braais are allowed, in order to preserve the earthy walls. But, if you wish to contribute to the social bonfire, you can bring your own wood. He also explained to us that, after some three years of managing the place, it was his and Monica’s last night at Gecko Creek. They were relocating to England and would be handing it over to a new couple the following evening. This was a surprise to us then – but it allowed us to meet more awesome people. Glenn then took us to the pool area. This offers great lounging chairs for relaxing or responsible tanning by the elongated pool. It’s also a really tranquil spot. At night, the pool area is lit with fairy lights and turns into a magical place to enjoy a nighttime dip. Night swimming is allowed but please be careful and quiet. From there, we walked across soft sand (I slipped my shoes off) with Glenn guiding us toward our tent. The views from both the tents and cabins are absolutely stunning… you can stand there in wonder, gazing out across the hidden valley. It’s also a particularly special sight to wake up to when all but the birds are sleeping still. That is what’s really unique about Gecko Creek. Not only are you in the midst of nature, with ample animal life, but above all else, a resounding, strangely moving silence prevails here. In fact, sometime after our arrival, we stopped moving and simply listened, and my boyfriend asked me, “Do you hear that?” I replied knowingly, “What? The silence? Yes, I do…” It is so wonderful, and is something they strive hard to preserve at Gecko Creek. Given that, during your stay at Gecko Creek Wilderness Lodge, please be advised that you must be quiet, responsible (especially when you drink). Also, keep in mind that Gecko Creek is only for adults and children, aged 16 years and up. That said, Gecko Creek does feel like a young adult’s ideal escape. Not that I feel older folks wouldn’t enjoy it too – but there’s something about it that is so youthful and free. Maybe it’s because there were mainly young couples during our weekend stay, or down to the place’s young-and-free atmosphere..
Once we got to our tent, we discovered each comes with its own pallet-style porch, with a table and chairs provided. Glenn opened our tent, showing us how it zips down at the tent’s mouth, and has window screening. The windows can be unzipped during the daytime to let some light in. The tents also have netting to keep out insects, but none bothered us on either night – whether we sat inside or out on our pallet porch. With our tour over, we stepped inside our tent, where two single beds pressed closely together, awaited us. There are blankets and duvets provided, but, during wintertime, you might want to bring your own with too. Because, due to its semi-desert climate, the Cederberg Wilderness gets pretty damn cold at night… So even if you visit on a scorcher of a day (as we did), expect the temperatures to drop. This will become most noticeable from midnight until the early morn. After unpacking as needed, we sat outside on the porch, chowing on our own yummy, pre-made hot dogs and absorbing the peaceful calm before we went to shower. Gecko Creek’s bathrooms are pretty and clean. They are like the ones you might find at a shopping mall, but cleaner and far more attractive. Especially with their outdoor water feature, benches, and leafy, natural decor. There are two toilet stalls and several showers and basins within, per bathroom, with one side for men and one for women. If you need to hang up your clothing while you shower, there are also wooden hooks and a bench inside. Each toilet has a bin, but there’s also a bigger one in the main bathroom area too. Whenever we moved around at night, we used either a torch or smartphone torch to guide us through the darkness. It was also so handy to have a magnetic torch, which I could hang in the shower because, while the bathrooms are lit up at night, the lighting is dim. After my shower, I lay on our bed in quiet wonder, gazing out at the stars… and what a lot there were to see on that clear starry, starry night. We met back at our tent after our showers and enjoyed more stargazing together before retiring for the night. 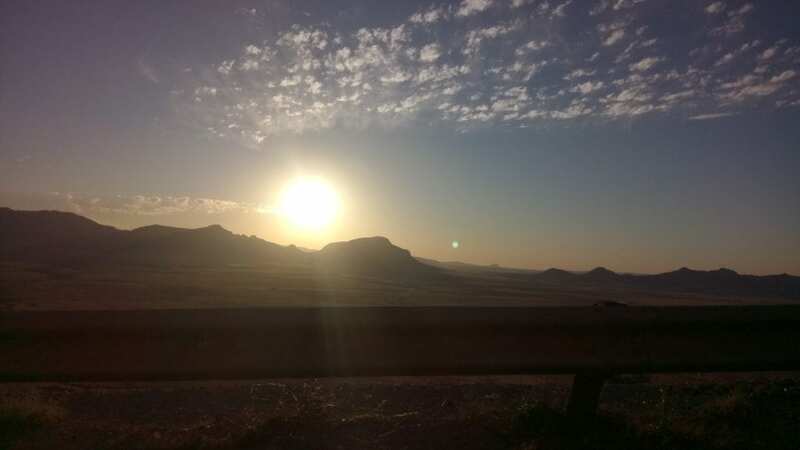 After all, we had a long day of Cederberg adventuring ahead of us! 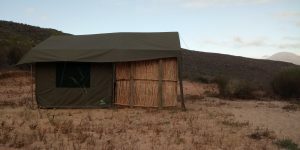 The next morning, after a very restful night, we zipped our tent up and made our way out into the real wilderness, heading for Cederberg Nature Reserve. Before we left Gecko Creek, we placed our supper order: a homemade beef burger (with cheese, as an extra R10) with chips for R75. This would prove to be not only delicious, but well-priced, given the meal’s size and quality. For me, it was an easy 9/10 rating because you can’t buy burgers like homemade ones. Around 19:30 pm (our chosen supper time), we headed to the lapa and enjoyed our homemade supper, Gecko Creek-style. 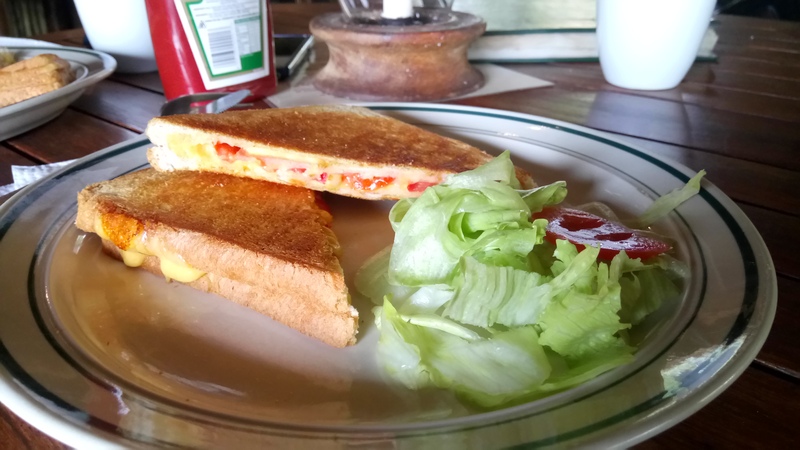 The food was so good that we decided to order ham, cheese and tomato toastie (with a choice of salad or chips; we got salad) (R40) for breakfast. 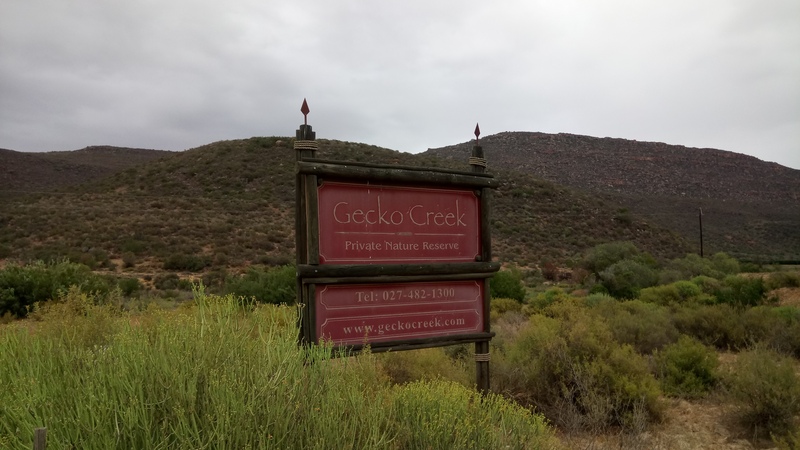 Our final night at Gecko Creek introduced us to the new managers: a lovely Belgian couple, Zoë and Loïc, who had stayed at Gecko Creek some time ago and told Glenn if he ever needed someone to run the place, they’d love to… and so now they are going to! The next morning, after a deep sleep, we cleaned and packed up and then made our way into the lapa for our last meal at Gecko Creek. Check-out is 10:00 am so we decided to order breakfast for then. Check-in is generally between lunchtime to one hour before sunset. After enjoying yet another wholesome, well-presented meal (8/10 rating for me) with coffee, it was time to say good-bye. Good correspondence before, during and after our stay. Clean,good facilities and wonderful mountain water. A stunning, peaceful farm setting. Proper quietness and professionalism, without sacrificing their rustic environment and nature preservation efforts. Delightful, yet simple accommodation options too. 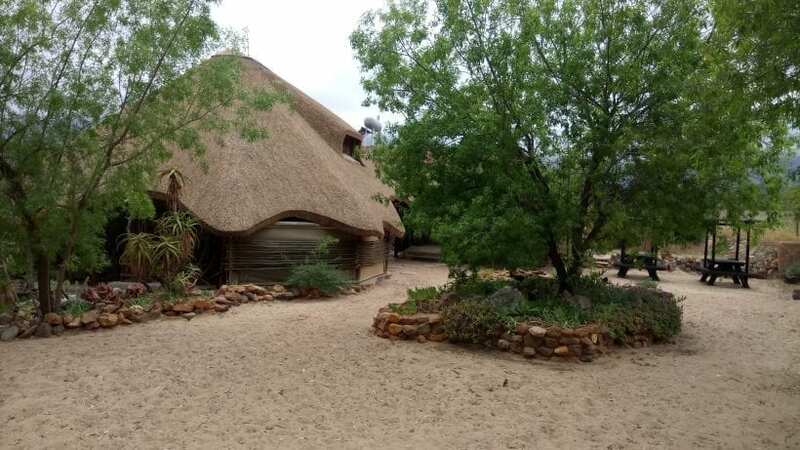 For more information on Gecko Creek Wilderness Lodge and its different accommodation offerings and prices, you can contact them on: (027) 482 1300. Or, email them at info@geckocreek.com, visit their website or find and follow them on Facebook. 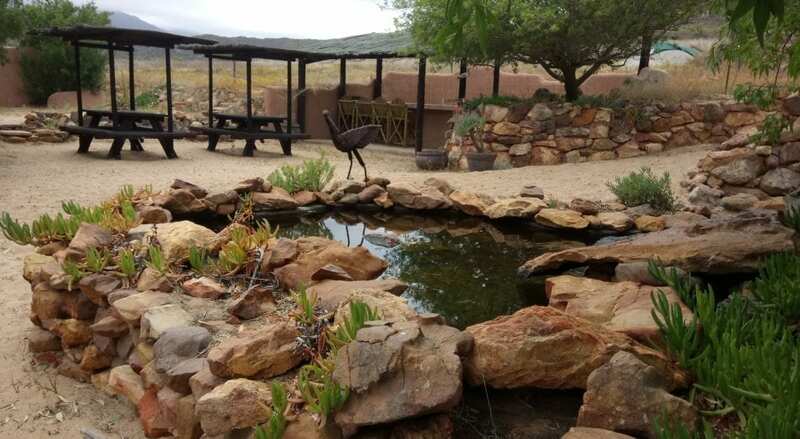 Alternatively, stay with them at: Gecko Creek Wilderness Lodge, Gecko Creek Road, Cederberg Remhoogte, Cederberg, Western Cape, South Africa. 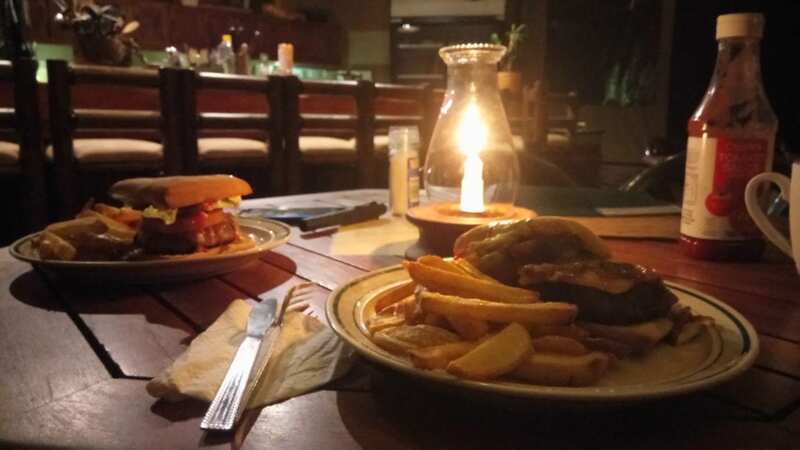 Thank you very much to Gecko Creek Wilderness Lodge overall, especially Linton, Monica and Glenn, Loïc and Zoë for having us, and for making our two-night stay so special and romantic in the most fun and rustic way! 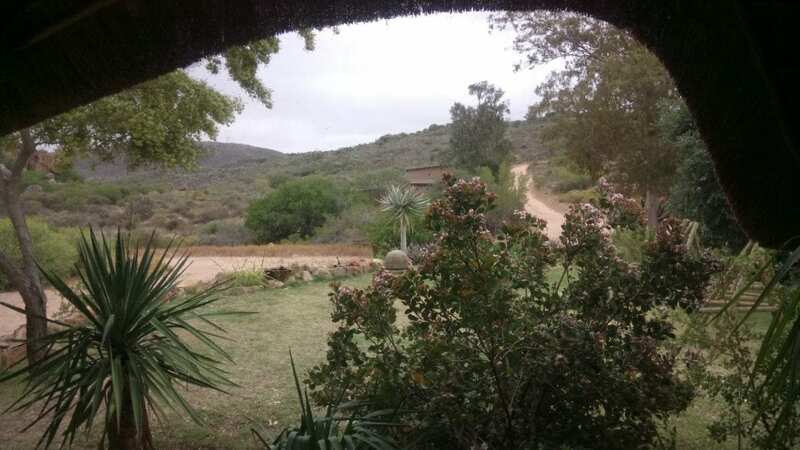 I really appreciate this thought – but I will unfortunately not be able to escape to the Cederberg in this time… Perhaps someday again in the future when you are back visiting here!